A trip to the countryside of Britain and an exploration of its pubs can uncover some hidden gems. 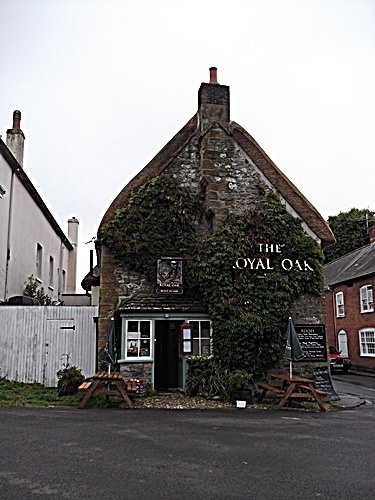 The Royal Oak, situated in Cerne Abbas, is one such example. 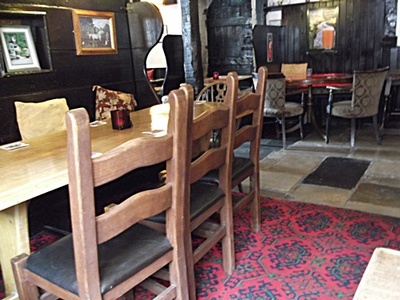 According to its owner, the establishment is one of the oldest pubs in the area, dating back to 1540. It's certainly the most beautiful construction in the village. The beautiful Tudor architecture is reminiscent of an old and cosy middle aged tavern. Inside, the Royal Oak couldn't be more inviting. Its decor with metal objects, photos of horses on the wall and rustic wooden tables create the environment of a traditional English pub. I have been to this pub on a rainy morning during a short trip to Dorset and it's a very popular place, with visitors coming from all over the world. A quick search on Google is enough to spot some reviews and pleasant comments about this welcoming pub. The menu is quite impressive as well. They currently have two menus on offer. The lunch time menu, which features light sandwiches, is perfect for travellers just passing through, while the evening menu is ideal for those staying in the village because it includes a variety of traditional English meals. Beef Wellington and Portland Crab Salad are popular options. If you fancy a drink, The Royal Oak has a variety of ales, wines and beers. As it was very early to drink and too late for having some breakfast, I chose a gorgeous mug of coffee and had a good chat about the origins of the pub and the history of the village itself. I also have decided to take a postcard as a souvenir from Royal Oak and found out it was painted by Susie Thorpe, a nice lady with whom I spoke minutes before in her shop while I was buying some souvenirs that show the "peculiarity" about the Cerne Abbas giant. Why? An inviting and historical pub in the middle of Cerne Abbas village, in Dorset.